Replacing Garage Door Springs is the only option when the springs break. There are two types of springs on garage doors. Extension springs are the ones that run alongside the overhead door track and have a pulley and cable attached to them. Torsion springs are mounted over the door and a long round shaft goes through them, with a wheel for the cable on each end. Torsion springs are generally used for larger heavier doors, usually 10' or greater in width. Without the springs the door is very difficult to lift. If you are here you have determined that you have a broken spring. A broken spring cannot be repaired, it must be replaced. Extension springs could be replaced by a homeowner. Do they just need adjustment? 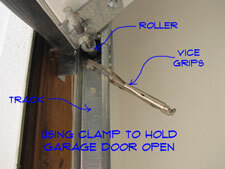 See the article 'Adjusting Garage Door Springs'. Torsion springs should not be attempted unless you have a good understanding of how they work, feel comfortable doing them and have taken safety precautions. Read on to find out if replacing garage door springs is something you want to tackle. Replacing the springs is a $150 to $200 job. If you decide to do it yourself you will spend between $30 and $50 for the parts. You could save between $120 and $150 if you do it yourself. An added danger is that the repairman may take the opportunity to try and sell you a new door. They can be quite convincing, when they are done you wonder how you survived this long with you outdated, cheaply made and poorly installed door. I suppose it is true sometimes. A new door could run into the thousands of dollars. Do you really hate your current door? No, well then just fix it yourself or have it repaired. The difficulty level of replacing garage door springs, varies with the type. Extension springs are challenging to replace. Torsion springs are dangerous and should only be attempted by those that have a good knowledge of how they work. I wish there was something simple. Either the spring is broken or it is not. If it is broken you have to replace it. With a broken spring your door won't work. You're already in kind of a pickle. The cables for a garage door extension spring can get a little tricky. You may struggle to get them hooked up. Worst case you may not finish the job in an evening. Take a breath and walk away if you get frustrated. 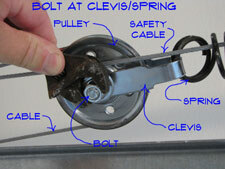 DIY Garage Door Spring Replacement requires above average mechanical skills. There are cables, rollers and tracks to deal with. The springs need to be unhooked from the door prior to replacement. This means the entire weight of the door will have to be dealt with. Safety concerns are very real. The other issue is getting the right springs. You will need several pieces of information before ordering new springs. Getting the weight of the door might be difficult and could involve actually weighing the garage door, see 'Purchasing Garage Door Springs'. A reputable firm will take care of your garage door spring replacement project for a few hundred dollars. You will not be able to save that entire amount, even if you do the work yourself. You will still have to buy the springs. If you do attempt this repair, make sure you are thoroughly familiar with all that is involved. Take adequate safety precautions and be very careful. WARNING!! 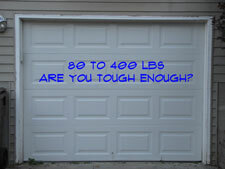 Garage Doors can be VERY HEAVY! Take Safety Precautions and get help before you attempt to lower a door that is not hooked to the springs!!! This is where I tell you to think about hiring this job out. The door is dangerous, the cables can be tricky and the job could take you several hours. You should be able to find someone to replace them for about $150 to $250. Don't think it is worth it? Read the next couple of paragraphs for some tips on calling a serviceman. Before you think about 'Hiring a Garage Door Repairman', write down the size and type of door that you have. Verify by examining them that the springs are broken. Springs either work or they don't, there is not much in between. Ask for a quote over the phone for a cost on replacing both extension springs. Make sure you specify both. Sometimes they will try to quote you for one spring and want to charge you double when they show up. It is always best to replace both springs. Garage door springs are rated for a certain number of cycles. When one breaks the other one won't be far behind. Call at least three places and try to make sure they are actually different places. Get quotes from all three. Try to get quotes over the phone, even if they are a range of costs. You want to avoid the 'hard sell' of a salesman. Remember, a door that worked before the spring broke does not need to be replaced. Make up your mind that you are not buying a new door. Get the best price you can for replacing garage door springs. Make up your mind not to be up sold when they come out. I say this as a warning, there are many honest and reputable firms out there. Unfortunately, it is sometimes difficult to tell the difference over the phone. Do your friends know anyone? Just an idea. Hiring a garage door repairman is a good choice if you don't want to tackle a big job like fixing a garage door. Just make sure you only pay for what you need. The following instructions are for 'Purchasing Garage Door Springs' that are the overhead type for smaller doors. These are commonly called 'Extension Springs'. See the article 'Garage Door Torsion Springs' for information on torsion springs. Extension springs are the ones that run alongside and above the tracks. 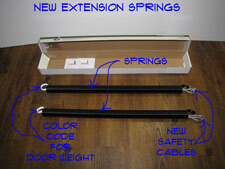 Generally, extension springs are used for smaller doors, 8' or 9' in size. You are going to need three pieces of information before you purchase your new springs. (1) The size of the ga rage door, 'Width' x 'Height'. (2) The weight of the door. (3) The length of the old springs. Use a tape measure to get the width and height of your door. It should be a nominal size such as, 8' 0" Wide X 7' 0" High. The length of the spring needs to be taken when the door is up or the spring is relaxed. Measuring the sum of the two pieces of broken spring will also work. Getting the weight may be more of a challenge. Many doors will not have the weight on it. You might be able to find the weight on the ID Tag for the door. Another option would be to look the weight of the door up online. To do this you will need to know the manufacturer, model number and style of the door. Use this information to search the Internet for the correct weight. For doors without an ID Tag, you will need to weigh the door. You can use a common analog bathroom scale for this exercise. You will need one or two short 2" x 4" pieces of lumber to place on the scale. When one spring is broken, place the scale under the corner of the door on the side with the broken spring. This will give you one half of the door weight. Multiply by two to get the correct weight. If both spring are broken you can place the scale in the center of the door. You may need some help lifting the door. The springs do most of the real work in lifting a garage door. Without them, the doors are heavy. With the above information in hand, you can get your replacement springs. You can get garage door extension springs from most home supply stores. They come in sets and don't even consider replacing one of them. When one breaks the other is not far behind. Get springs that are the closest to your garage door weight. You can also get them over the Internet. This takes a little longer, but may save you a few dollars. Purchasing garage door springs is not that difficult once you know the weight of your door. To start 'Removing Broken Garage Door Springs', raise the door as far up as you can and install vice grips or C clamps in the track. You don't want the door coming down while you are working on it. Try tugging on the door to make sure the clamps are tight. With door in the up position the tension in the spring is relaxed and it is safe to work on. Before you start take a good look at how the cables are threaded and connected. In fact, do you have a digital camera? Take some pictures, you may thank yourself later. Replacing garage door springs is easier if you can look at how they were. Next you will have to remove the safety cable. This cable is there so that the spring will not hurt anyone when it breaks. Remove the cable at the metal hanger near the end of the door track. There should be some type of eye bolt. The cable should have a clamp on it that can be loosened to give some slack in the cable. Pull the cable out of the spring and let it hang neatly off to the side until you are ready to re-install it. Remove the half of the spring that is connected to the eye bolt at the hanger. The other half of the spring is connected to the pulley via a metal clevis. You will have to use wrenches to unbolt the clevis from the pulley. Hold the pulley in place and put some tape around it to secure it to the cable. Lower the cable down and let it hang in a safe place. By now you should have a new set of springs to install. Replacing garage door springs is pretty hard if you don't get the new ones. In this series of articles we discussed all of the issues and steps that would be involved garage door spring replacement. This 'Summary' will give you a quick review of what was discussed. In addition, links are provided take you back to articles that you want review again or that you missed. Hopefully you have been successful in getting your problem taken care of. Either you hired someone to take care of it or you replaced your extension springs yourself.